After all the vampire craziness that happened in The Lost Boys, you’d think that characters in movies would stay far away from the beachy Santa Cruz, California. 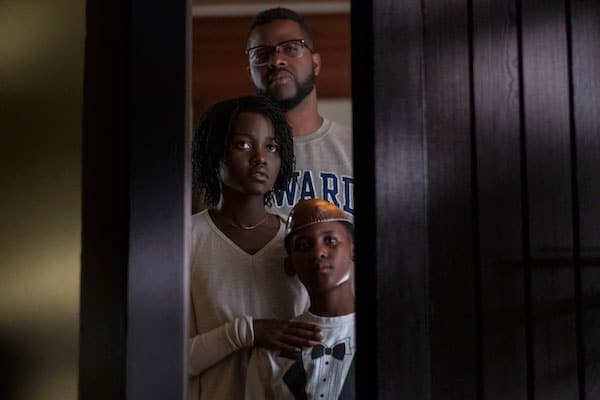 Luckily, no one told the Wilson family from Jordan Peele‘s latest outing, Us. Lupita Nyong’o and Winston Duke star as Adelaide and Gabe Wilson, a normal, average American mom and dad. Their kids, Zora (Shahadi Wright Joseph), who spends way too much time on her phone ignoring her family and Jason (Evan Alex) does magic tricks while hiding behind a Chewbacca mask. Dad, played wonderfully by Duke is the every dad; nerdy, protective and always trying to make his family laugh. But, it’s Mom Adelaide who’s the true leader of the family. What Mom says goes. The family has just arrived at their vacation house ready for a fun week at the beach and on the lake, courtesy of Dad’s boat, when strange things start to happen. Namely, a family appears at the end of their driveway that looks just like them, except, you know, they’re insane and hell-bent on killing them. There’s a long sequence where the doppelgangers have broken into the house and do their best to take get rid of their duplicates. During this encounter, we discover that Nyong’o’s doppelganger. Red, can actually talk. It’s a voice that’s painful to listen too and it’s creepy as hell. We soon discover that it’s not only the Wilson family that have a duplicate, everyone has their twin who’s out to kill them. There’s a fun scene (can mayhem and destruction be fun?) where their friends, Kitty and Josh (Elisabeth Moss and Tim Heidecker) are confronted at there vacation home to the tune of an NWA song. The film takes a while to get off the ground because it’s laying the groundwork to show how normal a family they are. If those scenes weren’t anchored by Nyong’o, Duke and the two young actors, it might be a little much to take but they’re so good and so perfect that it doesn’t feel like it has already been almost 45 minutes into the film before the insanity starts to happen. This is another great effort from Peele. From the casting, screenplay and the “Holy Crap!” final scene, he’s quickly turned into a director who’s a must-watch.